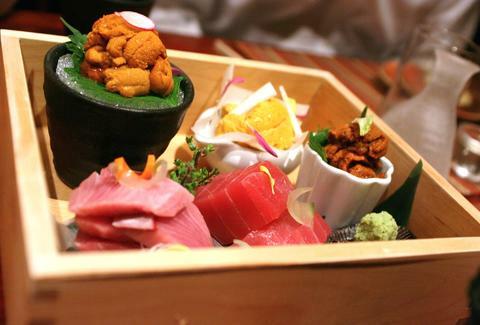 Don't get us wrong, when it comes to NYC sushi, Masa is great. And so is Yasuda. And Nakazawa. But, weirdly, there are, like, a LOT of other sushi places in NYC (weird, right? ), and a LOT of also-great ones that don't get nearly the same kind of media love. These are those places, the 10 best under-the-radar sushi spots in NYC, all of which you won't find on ANY of the recent "best of" lists from NY Mag, Time Out, Eater, Gothamist, or Village Voice. Good news for raw fish lovers -- while this subterranean Japanese restaurant is known for an exquisite kaiseki tasting that requires a strict reservation, the top-notch sushi and sashimi are offered a la carte at any time. 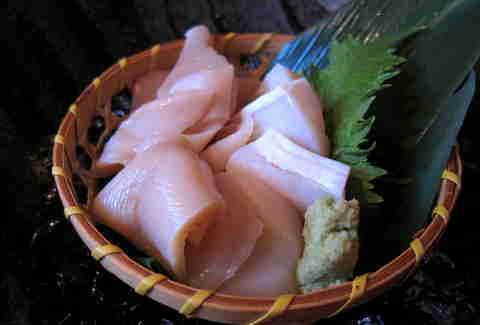 The ingredients change frequently, but the quality never wavers (expect the freshest Hokkaido octopus or Tasmanian salmon trout, for example). 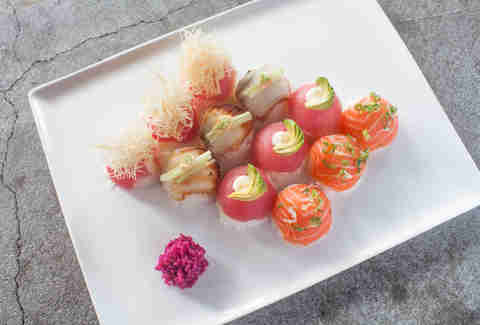 Pressed sushi is another specialty, featuring firmly-packed rectangles of shiso and ginger-infused rice topped with buttery mackerel or soy-marinated salmon. Armed with primo ingredients like Santa Barbara uni and king salmon, sushi masters (and Masa alums!!!) George Ruan and Jack Wei have turned their unassuming 9th St storefront into an unassuming 9th St temple of raw fish that rivals the city’s big-name joints (minus the high-roller price tags). 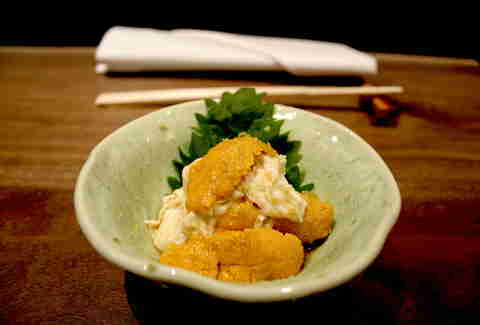 Don’t skip the namesake yuba dishes -- especially the sea urchin starter. Bypass the California roll-eating crowds and head straight to the wooden counter, which is presided over by a team of skilled fish slicers. From behind the bar, they dispense nigiri in its most traditional form -- mounds of tart, loosely-packed rice and slivers of fish amped up by a dabble of wasabi or a brush of citrus OR a brush of wasabi and a dabble of citrus. With an omakase that starts at just $45, dinner here is by far one of the best deals in town. 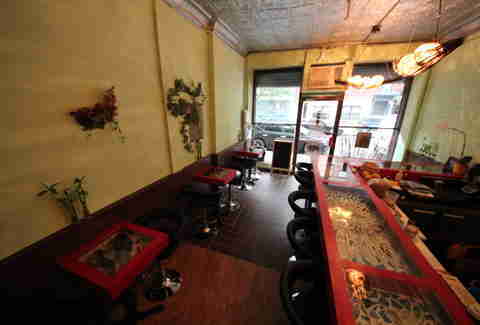 The sushi bombs at this wood-clad Bushwick hangout are, well, bomb. The brainchild of Makoto Suzuki, who also owns Williamsburg’s Samurai Mama and Bozu, the hefty seaweed-less orbs come in creative combos like the Spicy McBomb (tuna, cucumber, spicy mayo, katafi) and the McLow (tuna, avocado, wasabi cream). You’ll also want an order (or seven) of the pork betty -- slices are cooked ‘til tender in a sake-soy mixture and then served with tiny dollops of wasabi cream. This neighborhood standby is one of few places in NYC doling out Kyoto-style hako sushi, which is made by pressing layers of rice, minty shiso leaves, and fish into a box. The rectangular bites -- showcasing eel, grilled Spanish mackerel, or tuna -- are a must, while Hibino’s signature ultra-creamy tofu is a double-must. Yes, tofu. Get over it. Don’t worry, there are no actual insects on the menu at this pint-sized gem helmed by Chef Sho Boo. Defying Japanese custom -- which once barred women from making sushi -- the Osaka native mastered the craft at Jewel Bako and Sushi Yasuda before opening her own 15-seat restaurant. Here, the nigiri is punched up with house-made sauces and salts (think fluke slicked with wasabi pesto and snapper topped with plum jam). It may not boast the same brand name recognition as fellow Midtowners like Sushi Yasuda or Sushi of Gari, but this lesser known fish den certainly deserves some attention. Along with two pristine omakase options, Sushi Zen also dishes out three bluefin tuna specials, a luxe chirashi bowl, and, for thrill-seekers/Homer Simpson, a seasonal fugu (blowfish) sushi. This standby was around long before the East Village became New York City’s unofficial Japantown. Opened in 1984 by Bon Yagi -- the empire-builder behind Sobaya, Otafuku, and Sake Bar Decibel -- the neighborhood staple continues to rock out with its sashimi out, thanks to high-quality fish and affordable prices. The lunchtime platters are especially good deals. Sometimes, those sushi cravings call for regular old boring rolls. But OTHER times, they call for crazy, over-the-top, O, M, G rolls. When you're dealing with the latter, this is the place to get ‘em -- the date night favorite doesn’t skimp on creativity when it comes to its specialty rolls (like the Bumble Bee, with spicy crab meat, cucumber, mango, or the Park Avenue, with tuna, salmon, radish sprouts), but Watawa also knows when to dial down the modernist accents. 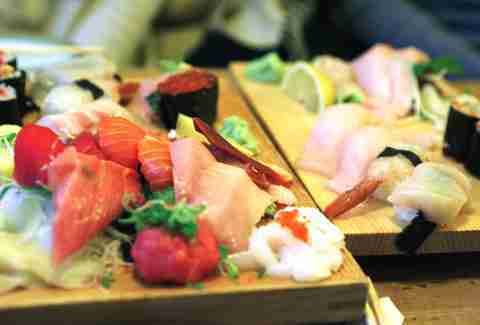 The sushi and sashimi assortments are refreshingly simple and rely solely on the freshness of the fish. Despite its no-frills environment, diners queue up daily to get their hands on Tomoe’s delicious rawness. The monster-sized pieces of sushi and sashimi, plus the skillfully assembled hand rolls (the spicy tuna in particular), are well worth the (also sometimes-monster) wait.